We’ve added a 70s oldies to one of our playlists that takes us back to 1973 and the Nixon era when The Carpenters were the clean cut idols of middle class era. ‘Sing’ is a US Top 40 Number 3 hit single. Richard and Karen Carpenter at the White House in 1973. It was the year that their song Sing (a Song) was a Number 3 in the Billboard Hot 100 hit in America. The songs was featured on Sesame Street and even had a kids choir singing in the track. 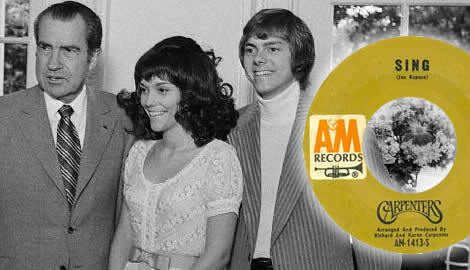 The Carpenters were clean cut musical idols in a time which today we look back on with warmth and nostalgia. This week we recall The Carpenters, one of the greatest musical acts that has always been part of the Capitol.fm playlist with classic oldies from the 1970s that are simply timeless and part of our life. Truly the Sound of Lifetime. This song we have added to our A list this week as a softer sound. It’s the Billboard Hot 100 No 3 hit single for 1973 called Sing (a Song). You might recognise it. For a start, it started in Sesame Street and features a children’s choir. Sure, it’s corny and sentimental, but it’s still great music. The Carpenters came into the music in 1965 as a jazz trio when Richard Carpenter teamed with his sister Karen and Wes Jacobs. The Carpenter twins were born originally in New Haven Connecticut in 1963 the twins moved to Downey in California. By 1965, while in high school, Karen had developed a talent for playing the drums. She wasn’t long teaming up with her brother to perform. The duo signed to A&M Records in 1969 as ‘The Carpenters’ and had some minor hits but the big breakthrough came with the Burt Bacharach song ‘Closer to you’ in 1970 which reached Number 1 in the Billboard hot 100 in July that year. The band went on to become a legend of the music industry throughout the 1970s.We will have plenty room to write and hear more about all of that here. It was Karen’s tragic death from complications associated with anorexia that finally brought the curtain down on what is still perhaps one of the greatest sounds in popular music. Our new playlist song this week, Sing, was a hit in 1973. It was the year the The Carpenters were the clean cut conservative idols of middle class America. The duo visited the White House in 1972 and again in 1973 just as President Nixon was grappling the spiralling Watergate crisis. ‘Sing’ brings us back to a day and age when the world was still full of hope. It is a time that many of us remember with fondness and nostalgia. Perhaps because many of us watched as children on Sesame Street with Big Bird all those years ago to the sound of The Carpenters music and their hit, Sing a Song.